Omar Khan has been in charge of contract negotiations and managing the salary cap as the Pittsburgh Steelers' director of football and business operations. 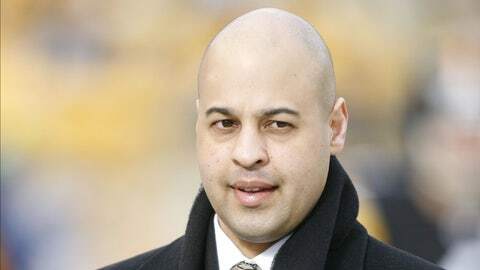 MIAMI — Pittsburgh Steelers director of football and business administration Omar Khan is one of three candidates who have interviewed for the job as general manager of the Miami Dolphins. The team said Friday it also interviewed Arizona Cardinals vice president of player personnel Jason Licht and Dolphins assistant general manager Brian Gaine. All are candidates to replace Jeff Ireland, who left Wednesday after six seasons. Former Redskins offensive coordinator Kyle Shanahan and Eagles quarterbacks coach Bill Lazor have interviewed for the job of offensive coordinator. Both are candidates to replace Mike Sherman, fired Monday after two seasons with Miami. 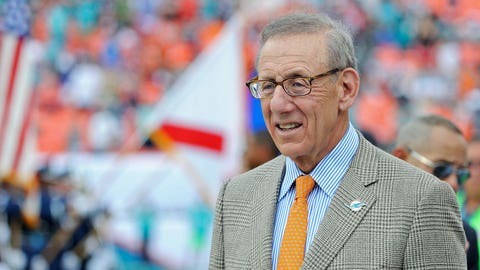 Stephen Ross clarified the process the Miami Dolphins will follow in hiring their new GM. More candidates are expected to be interviewed for both jobs. Khan joined the Steelers in 2000, when he was 23, and has worked for two Super Bowl championship teams. He’s in charge of contract negotiations and managing the salary cap. Licht worked with the Dolphins in 1995-96 as a scouting assistant and as an assistant coach. He joined the Cardinals in 2012 after three seasons as the New England Patriots’ director of pro personnel. Gaine has been Ireland’s top assistant the past three years. He and Khan interviewed for the New York Jets’ job as general manager a year ago. Shanahan worked for four seasons in Washington with his father, Mike, the head coach, until both were fired Dec. 30. Kyle Shanahan became the NFL’s youngest offensive coordinator at age 28 when he was promoted to the position with the Texans in 2008. His predecessor there: Sherman. Lazor joined the Eagles a year ago when Chip Kelly was hired as head coach. Lazor was offensive coordinator at the University of Virginia from 2010 to 2012, and he has worked for the Redskins, Seattle Seahawks and Atlanta Falcons.